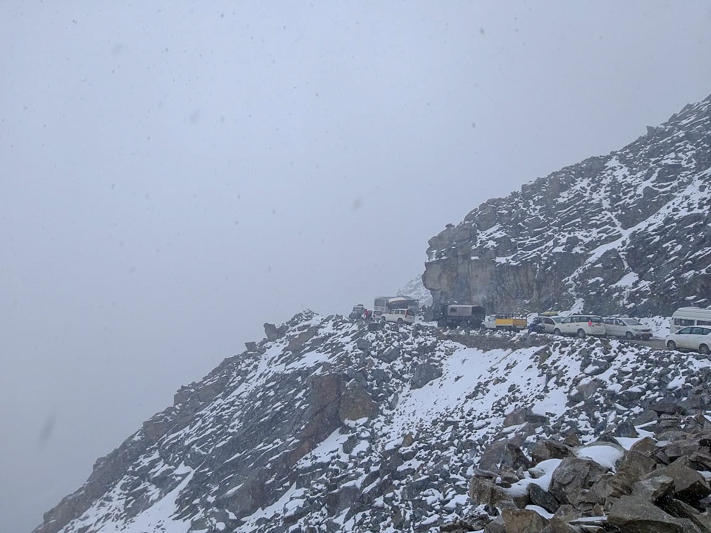 Below are a few pictures of snowfall at Khardung La this year in first week of September. These were clicked at top of the peak and this was the first spell of snow for this season. 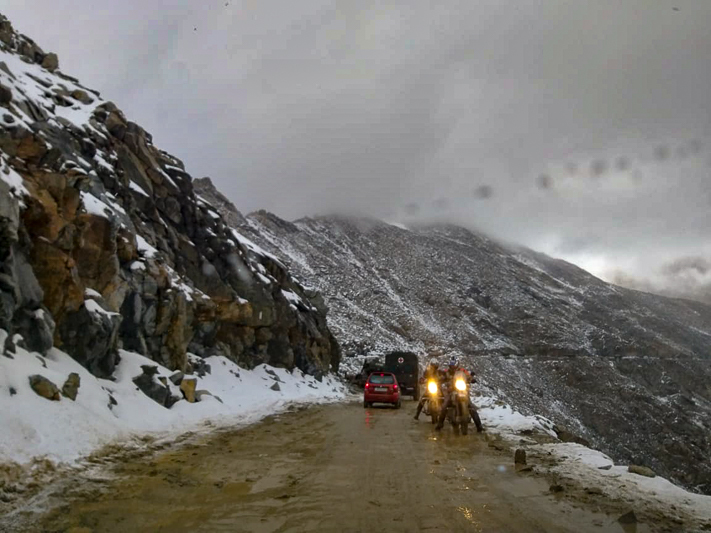 It usually starts to snow at Khardung La by mid September; bringing down the temperature quite a bit even in lower areas like Leh city and other villages of Nubra valley. If you were planning a trip to Ladakh in next few weeks; then please ensure that you are packing your bags carefully. There is a definite chill in the air and nights have already started to get very cold. Weather will continue to get colder from here on by each passing day. A pair of thermals and woolens accompanied by a heavy warm and windproof jacket is a must. Don’t forget to carry a pair of gloves, muffler and some cold cream as well. Ladakh festival is just coming up between 20th to 23rd September so that is another great reason to plan your trip within September. If the idea was of October then it would be better to plan the trip from Srinagar side only. Rohtang Pass has already seen its first snowfall this year and it is only days before Baralacha La too witnesses snow. In October, Manali to Leh road just becomes a bit too risky to be driving on. All the internal roads within Ladakh however will continue to remain open. You may not reach Ladakh by road in peak winter but can definitely travel around in Ladakh; to places like Nubra and Pangong. 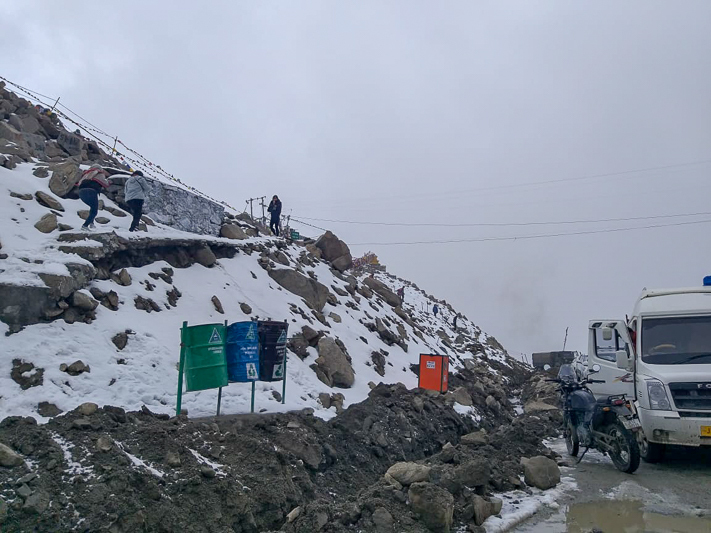 There could be a temporary roadblock owing to snowfall at Khardung La and Chang La; but Army clears the road just as soon as they are able to; and restore the connectivity. I hope the information above was of help. If you have any further questions; please feel free to ask in the comments section below; or at our Community Forum; and I will be glad to answer. I am travelling to Leh by end of April 2019 till 4th May. Will we encounter snow during this time? Hi Shweta – At top of the passes yes you will find some. I meant snow fall… we ll encounter snow fall ?? No, there won’t be a snowfall at this time. Hi Vargis ji, any pass where we can experience snow during Aug 10th – 25th? Also please suggest if it’s ideal climate for a bike trip during this span. will we encounter snowfall in the month of may on way from srinagar to leh and return back via manali? Your blog is so informative, keep up the good work! I am travelling to Leh from 5th October – 16th October, will it a good climate. Also, I wanted to know if you have contacts for Bike rentals. Thanks Sony. Weather is going to be very cold so please make sure that you are packing accordingly. Sorry but I do not have any bike rental contacts. Hii Is there itbp camp in shyok? Army is posted there, don’t think ITBP has a camp there. Any updates on current condition in Ladakh Region? Have heard that it is raining heavily in Leh and surrounding areas continuously. 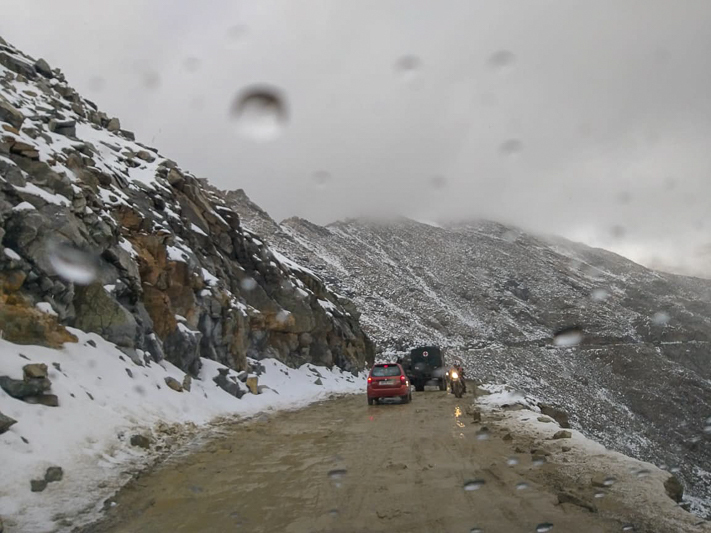 Also, that Khardungla and Changla have been reported to be closed down due to snowfall as precautionary measure. Yes, it is snowing all across. Rohtang, Baralacha La, Zoji La, Kunzum Pass are all closed. Every Khardung La was closed. It started to snow early everywhere. I am planning a trip in december. I will reach leh by flight. I would stay for 8 days. I have no fixed itinerary. 1. Is riding bike at december advisiable? or go by public transport? 2. I would like to visit nubra – pangong – hanle-tsomorri leh ( any of these places) ??? 3. Will taxi run during december? or a shared cab? 3. Very less chance of finding shared cab. We (4people) are planning to go khardunga by scooty October 1week …Is it a good decision? Vargis Bhai .. I am travelling to leh on friday, will be there till 28th. Will all passes, roads and other activities will be open or close down ? We are 6 people in total travelling in 4 bikes from kerala.just reached Hubli.planning to reach leh before 25th.can u suggest some travel options for better enjoyment? Is it possible to visit leh after september 25? Yes it is but just be prepared for the cold weather.